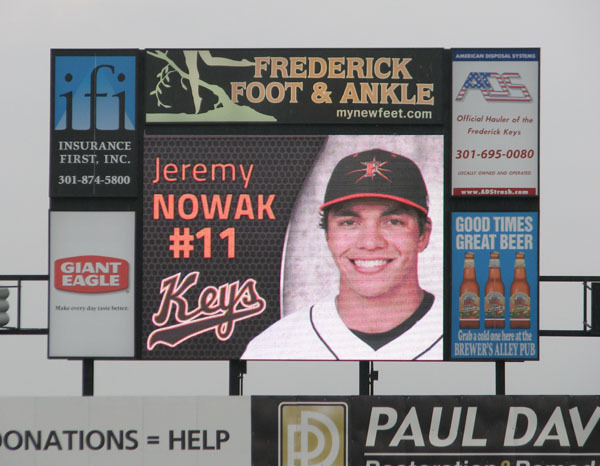 If you’ve been following this blog for a while, you’ll likely recall the awesome adventure I had with Baltimore Orioles prospect Jeremy Nowak. If not, take a couple minutes to read part one and part two of the story. 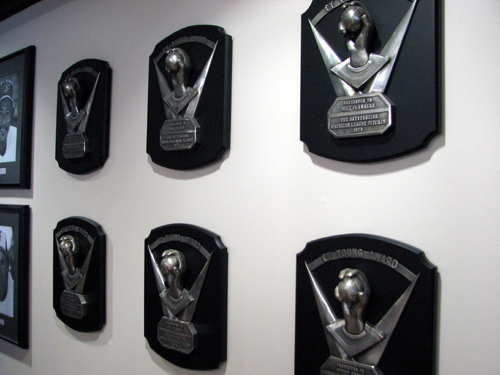 I’m confident that you’ll agree it’s one of the feel-good baseball stories of 2012. 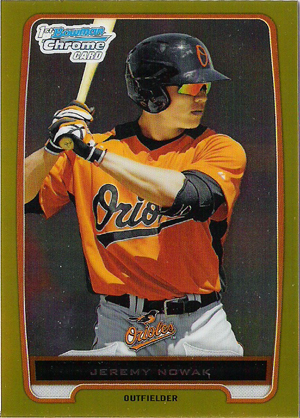 I’m anxious to see where Jeremy gets assigned to start the season and after a very impressive 2013 campaign in High-A Frederick, I’ll enjoy following his career again this season. I’ve collected baseball cards on and off since the late 1980s, and when I learned last fall that Jeremy was featured on a number of cards in the 2012 Bowman Chrome set, I knew I had to collect as many as I could. It’s been fun to add a bunch of his cards to my collection over the last few months, and while I’m always scouring eBay for new additions, I thought I’d share the cards I have now. 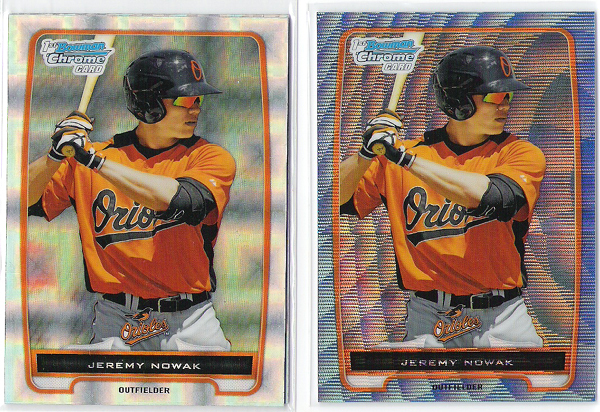 On the left we have Jeremy’s base card, which you’ll notice reads “1st Bowman Chrome Card,” as it’s his first appearance in any official (rather than issued by a team) baseball card set. 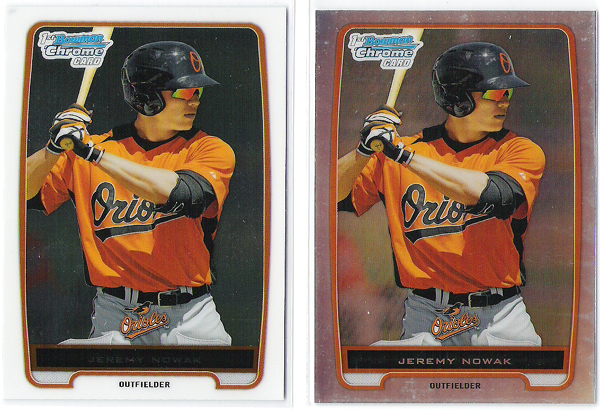 On the right is the Refractor version of the card, which is Topps’ fancy way of saying it’s shiny. If you look at the two cards together, you’ll notice that the base card has a white border and the Refractor has a metallic border. It also shimmers in the light when you tilt it. 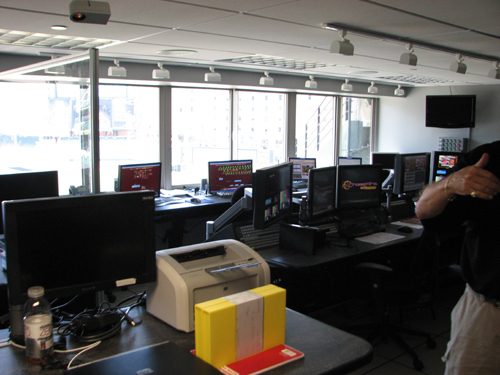 Next up, and pictured above, are the Xfractor and Blue Wave Refractor on the left and right, respectively. The Xfractor, you’ll see, is metallic like the Refractor, but is made up of squares, which didn’t really come through in the scan. The Blue Wave Refractor looks awesome when you move it in the light. 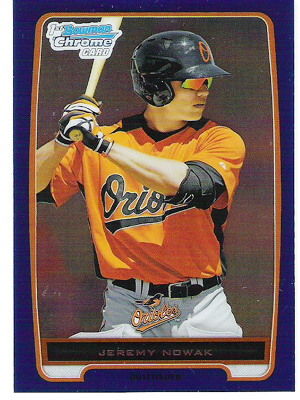 As I understand it, this card wasn’t available in packs — you had to send your package wrappers in to Topps, which would then send you packs of Blue Wave Refractors. The above two cards are pretty cool and one is serial numbered. Experienced collectors will know what this means, but if you’re new to the collecting game, it means each card has a unique number stamped on it. 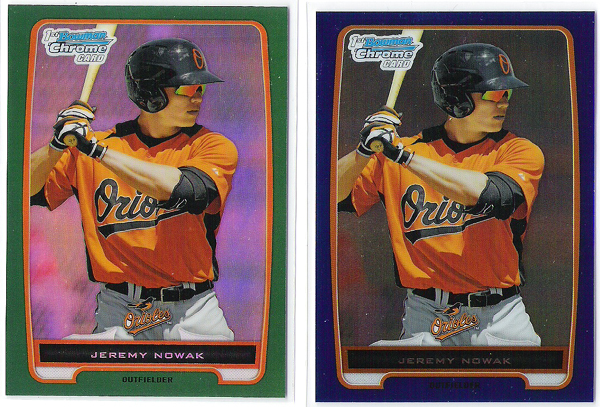 On the left, the Green Refractor isn’t numbered, but it’s a fairly rare pull. On the left, the Blue Refractor is numbered 86/250, which means that Topps only produced 250 of this card and mine is number 86. The final two cards are the rarest of Jeremy’s cards that I have so far. 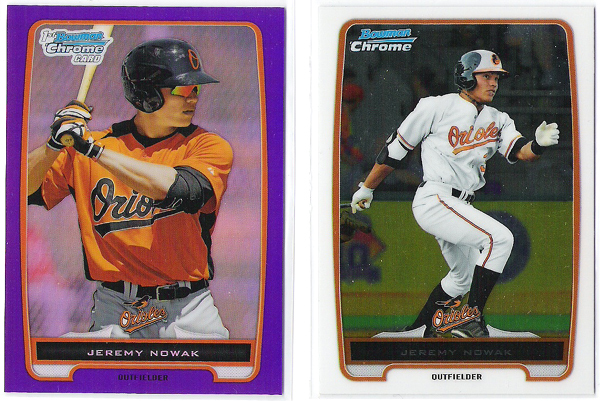 As you might guess, the Purple Refractor is the one on the left. It’s numbered 97/199, which means that it’s rarer than the Blue Refractor. And finally, on the right, you’ll see Jeremy’s short-print variation. 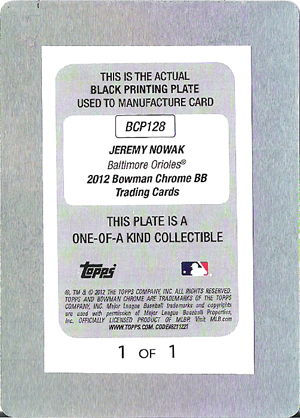 Each card in the 2012 Bowman Chrome set has a short print, or SP. These cards aren’t numbered but the rumor is that only about 75 of each exist, making them extremely rare. 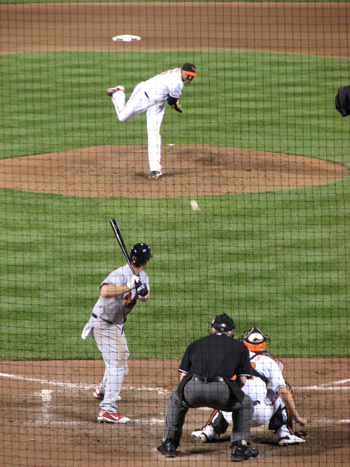 As you’ll see, the photo is of Jeremy in the Orioles home uniform, which is doctored, unfortunately. 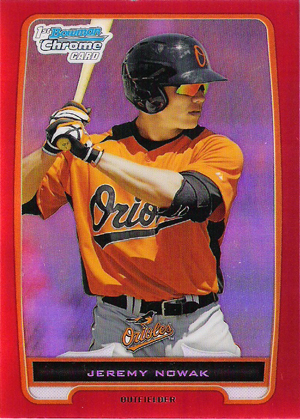 The other cards feature him in Baltimore’s Spring Training uniform, but unless I’m mistaken, the SP card is Photoshopped. There are still a handful of Jeremy’s cards in the set, including cards numbered out of 50, 25 and even 5! I recently bought one numbered out of 50 on eBay, but the seller had to refund me because he lost the card. Here’s hoping he tracks it down. 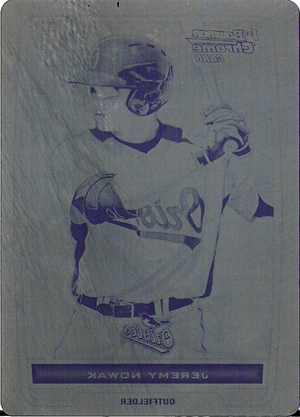 Rarer cards that I’ll likely never encounter are the four printing plates used to make the card (each numbered out of 1) and the Superfractor, which is numbered out of 1, too. The Superfractor sold several months back in the neighborhood of $165, and because many collectors are obsessed with hanging onto Superfractors, I don’t know when it’ll hit the market again. Even though the fronts are all different, the backs are basically the same. 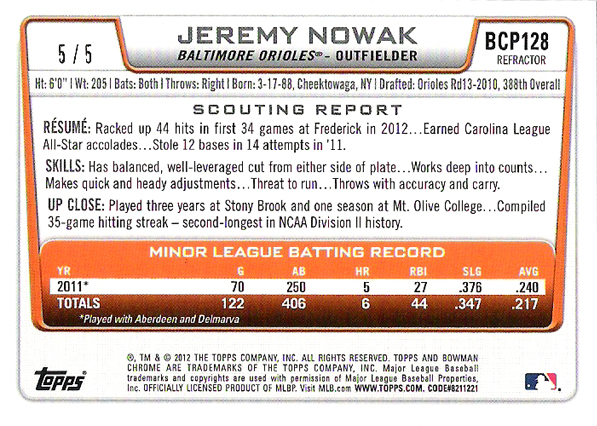 The back was neat to read; I had no idea about his 35-game hitting streak in college, for example. 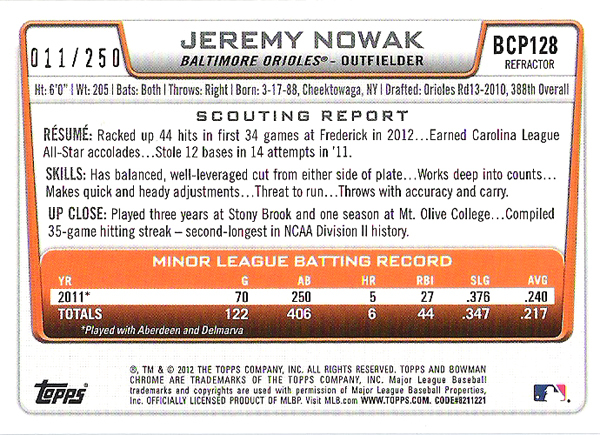 Finally, I can’t resist adding that if you check out his 2011 home run totals toward the bottom of the card, one of those five long balls is the one I retrieved! 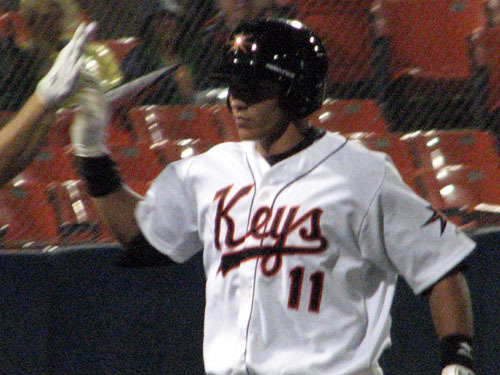 The significance of this number is this is the uniform number Jeremy wore in 2012 with the Frederick Keys. Collectors go nuts for numbered cards that feature a player’s uniform number, and I’m no different. I’m pumped to add this one to the collection! If you’ve read the details of my first baseball road trip of 2012 by now, you’ll know that I’ve been saving the best story for last. But first, a little background. 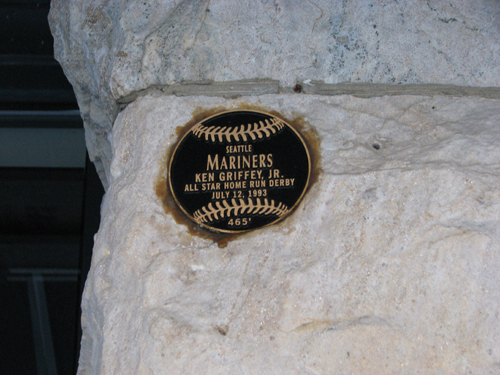 My trip would include a stop at Harry Grove Stadium, home of the Frederick Keys, but this visit would be extra special. 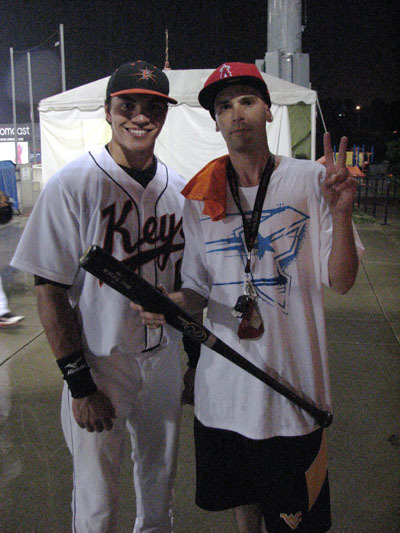 Finally, I’d get the chance to meet Keys outfielder Jeremy Nowak, who I’ve been in touch with since last December. 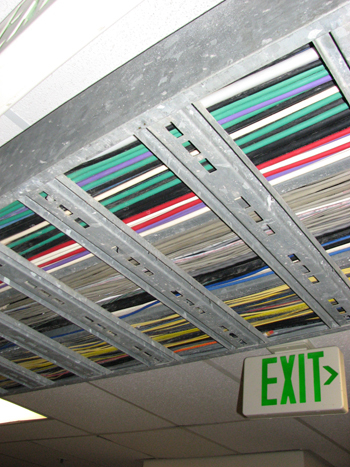 The full story is at this link, and I definitely recommend you check it out before proceeding. It’s a definite baseball feel-good story. The weather throughout the afternoon of the game was miserable enough that at times, it looked like the game would be called off before it even began. Still, I hoped to spot Jeremy on the field — or in the players’ parking lot, at worst — at some point to say hello. At the end of the warmup, I stood at the fence and when Jeremy looked up, we sort of made eye contact and he came over to say hello. Even though the game was fast approaching, he was enormously friendly and it was awesome to finally meet him. I wanted to get a photo with him, and we decided to meet up again after the game. 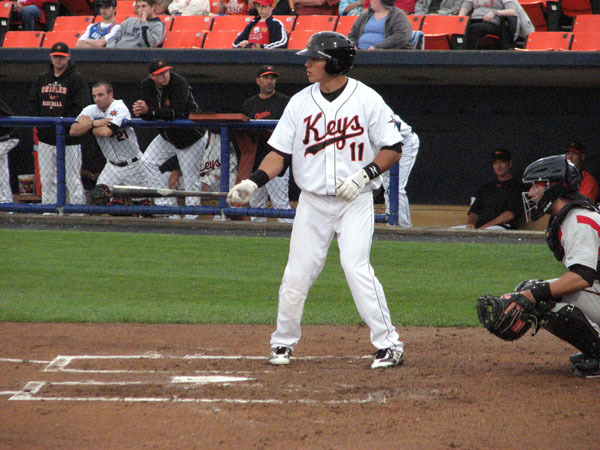 Then, with runners on second and third and one out, and the the Keys trailing 2-0, Jeremy blasted a Kyle Blair pitch over the fence in right field! 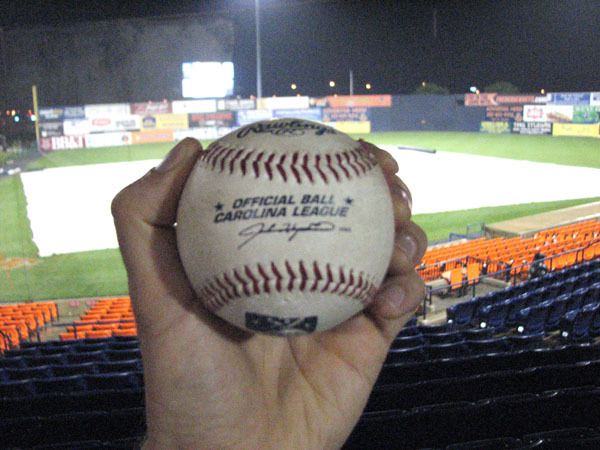 It was on a line and hit the billboards above and behind the outfield fence hard enough that it bounced back onto the field, where Mudcats right fielder Anthony Gallas scooped it up and tossed it to the Frederick bullpen. 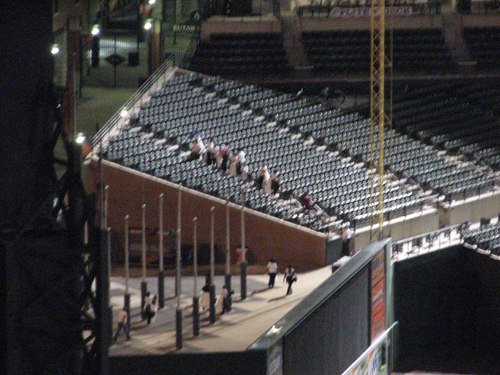 From there, a Keys reliever flipped the to ball to a couple fans who’d run to the area. JEREMY JUST HIT A HOME RUN!!!!!!!!! 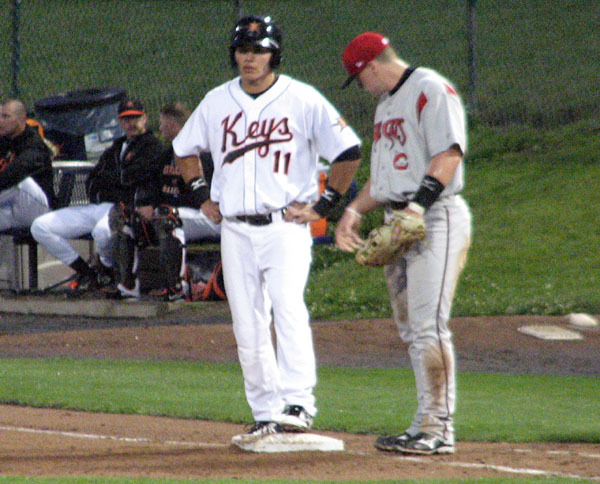 Jeremy had one more at-bat (a strikeout in the two-run sixth) and as the rain intensified, the game was called in the seventh. Final score: Frederick 7, Carolina 2. In other words, Jeremy’s three-run bomb scored the game’s winning runs. Then he disappeared as I stood there starting to suspect what was happening. 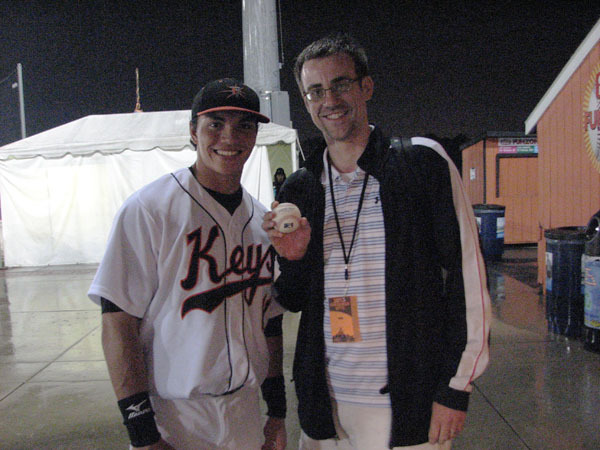 I’d long since stopped hoping I might get the ball; to me, the big prize was not only meeting him, but seeing him hit a game-winning home run for the Keys. Minutes later, Jeremy returned with a ball in his hand and a fan trailing behind — only the fan was carrying a bat that I knew was Jeremy’s. It turns out that he’d given the fan one of his bats in exchange for getting the ball back. You know how you sometimes build something up in your mind and then the actual event falls short? And other times, it’s pretty much what you expected. This game and its events absolutely blew me away and were far better than I could’ve dreamed. I can’t imagine what will top it — perhaps catching Jeremy’s first MLB home run when he’s playing for the Orioles! Thank you, Jeremy, for not only the ball, but for being so accommodating. 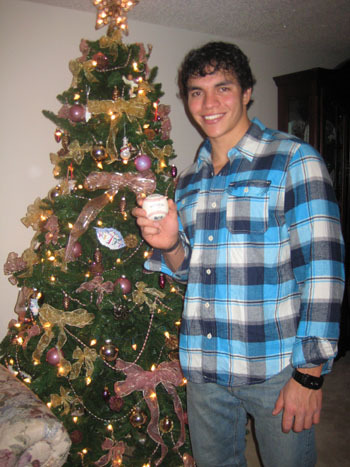 One of Jeremy’s relatives told me prior to meeting him that as good a ballplayer as he is, he’s a better person. I can say that in addition to playing the game at a very high level, he’s also an athlete who treats his fans well. He certainly didn’t need to give me the ball, and I appreciate him giving away one of his bats to get the ball back. It means a ton. As always, please check out The Ballpark Guide to help plan your upcoming trips and keep an eye on this blog as I gear up for my second road trip of the summer. You can also follow me on Twitter or send me an email to keep in touch. 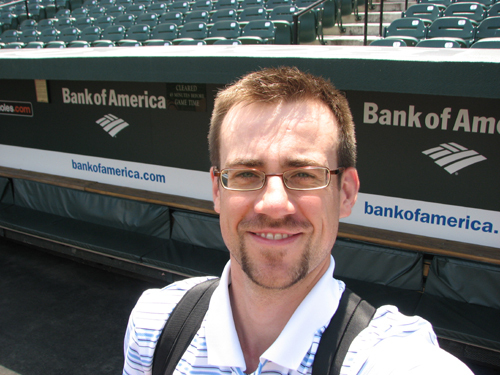 Traveling to dozens of professional ballparks for my website, TheBallparkGuide.com, has yielded some pretty amazing experiences over the past two summers. 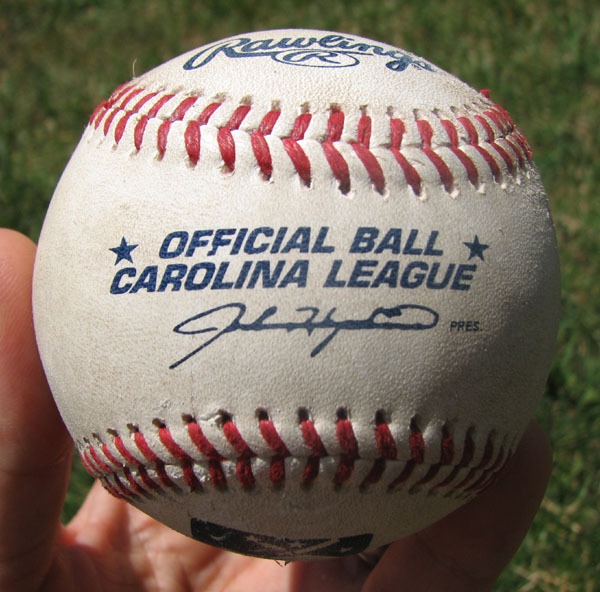 This is a story about my best ballpark souvenir ever and how it led to a pro ball player’s best Christmas. 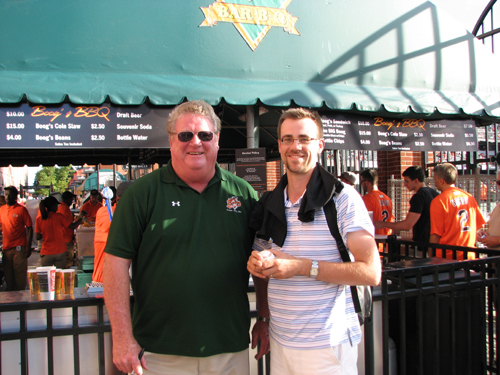 Last summer, in the midst of a 12-day, 13-game road trip, I visited Arthur W. Perdue Stadium to watch the South Atlantic League’s Delmarva Shorebirds play the Greensboro Grasshoppers. 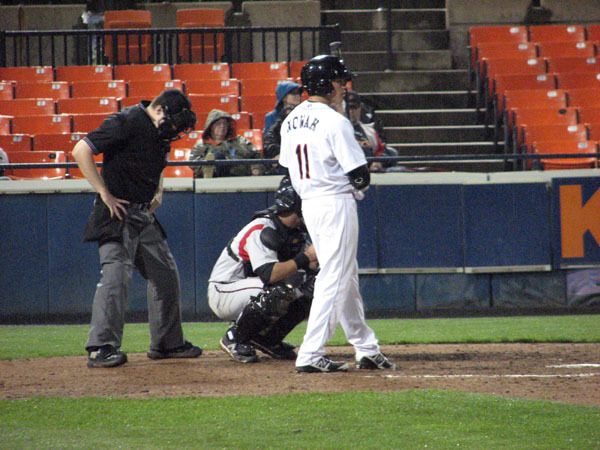 In the second inning, as I sat on the third base side, Delmarva Shorebirds left fielder Jeremy Nowak stepped to the plate and dug in against Greensboro starter Rett Varner. Varner had already struck out two Shorebirds in the game, but Nowak jumped on the pitch and launched it over the fence in left-center field. 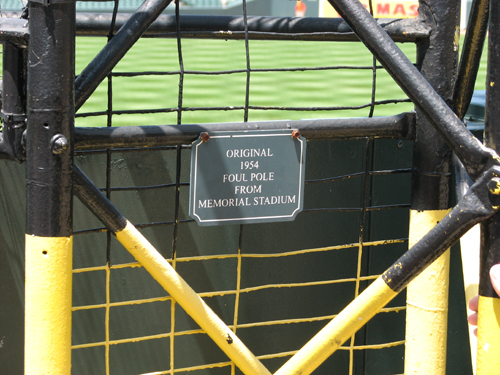 During pre-game batting practice, I’d managed to snag 12 balls behind the outfield fence. As I watched Nowak’s shot disappear over the fence, I wondered if another fan or a team employee would go retrieve the ball. 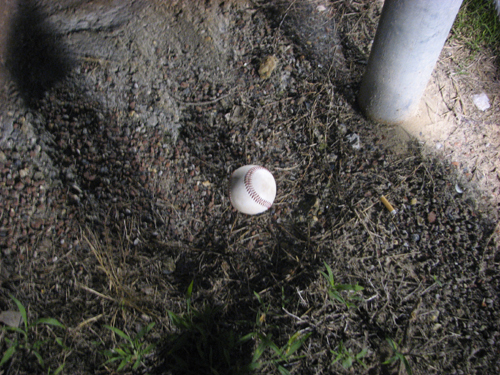 Or, perhaps, would the ball be sitting on the grass undisturbed? This question lingered in my mind as I watched the game unfold, and at the end of the eighth inning, I decided to duck out early and see if the ball was still there. 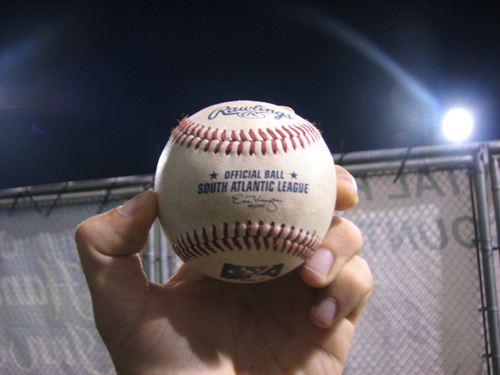 My first home run ball! When I got back to my hotel, I checked the box score to see how the game ended. 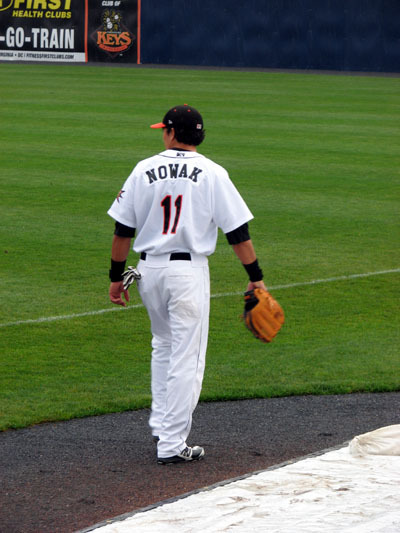 It turns out that Delmarva lost 2-1; Nowak’s home run was the only run the Shorebirds scored. 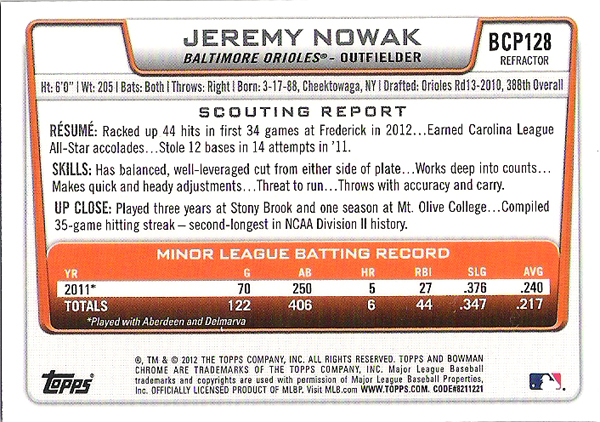 I also took a look at Nowak’s stats to learn a bit about him. 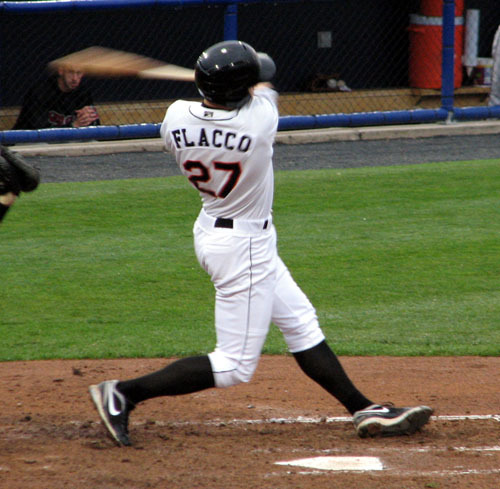 A 13th round pick of the Baltimore Orioles in the 2010 First-Year Player Draft out of Mount Olive College, he spent 2010 with the Short-Season A Aberdeen IronBirds. 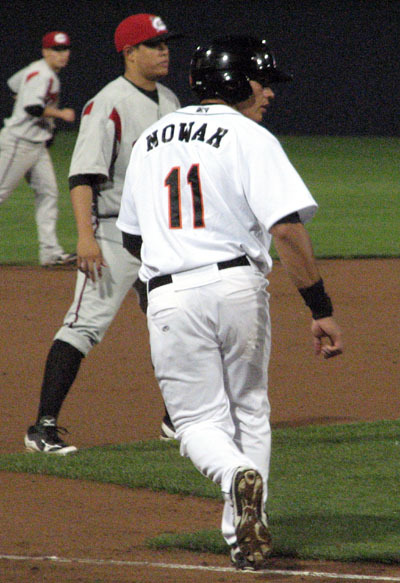 He began the 2011 season in Aberdeen, too, but after collecting eight hits, two home runs and six RBIs in his first eight games, Nowak earned a promotion to Delmarva. 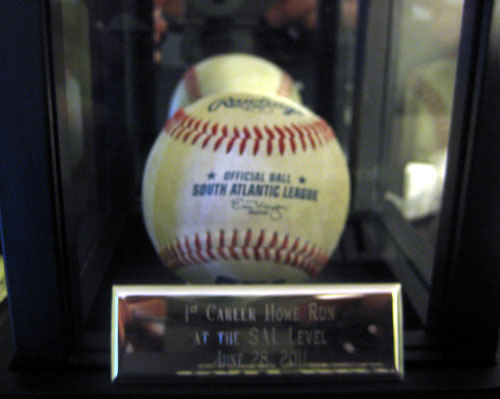 I also saw that he hadn’t had any South Atlantic League home runs before the one I saw. 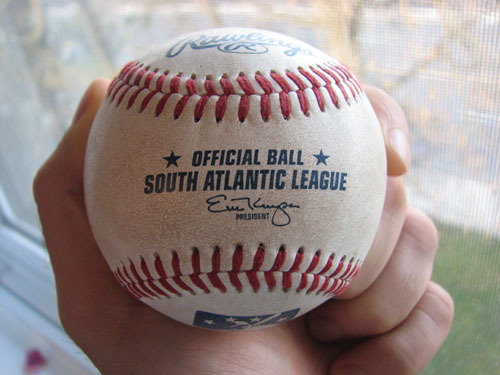 All this is a long way of saying the home run ball sitting in my backpack was Nowak’s first at the South Atlantic League level. 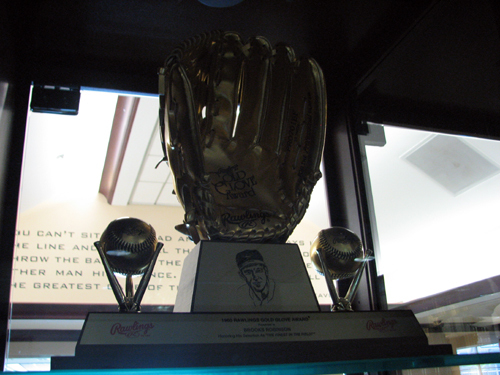 I was driving to Baltimore the next morning, but I wondered if I could leave the ball at Perdue Stadium’s ticket office for Nowak to pick up. Ideally, I would’ve loved to meet him to hand over the ball, too. Unfortunately, I didn’t get a response. Fast forward to the middle of December, when I received an email from Alicia, who is Nowak’s girlfriend. My boyfriend Jeremy Nowak recently showed me your Ballpark Guide website. 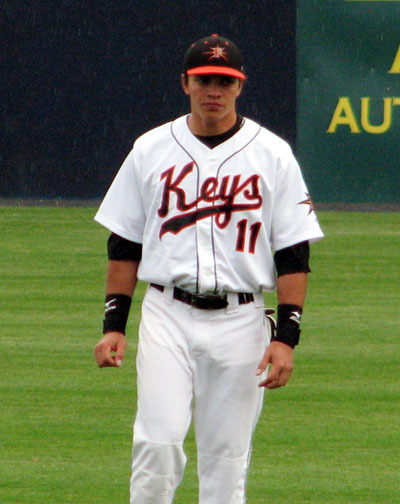 Jeremy plays outfield for the Delmarva Shorebirds. You visited his stadium back in June and wrote an article about your experience on your website. Jeremy said that he randomly stumbled upon your blog one day when he was fooling around on the computer and googling his name. 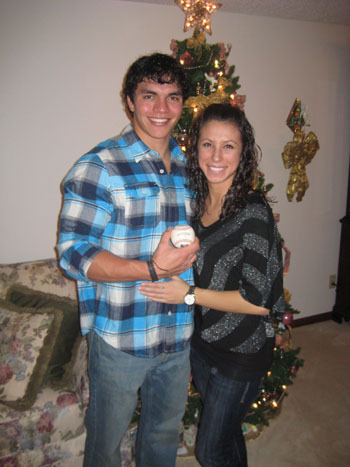 He was so shocked to get to the end of the article and to see that you found his home run ball! He told me that he would love to have the ball. As soon as Jeremy said that, I knew that I wanted to try to get the ball back for him because I know it would mean so much to him. 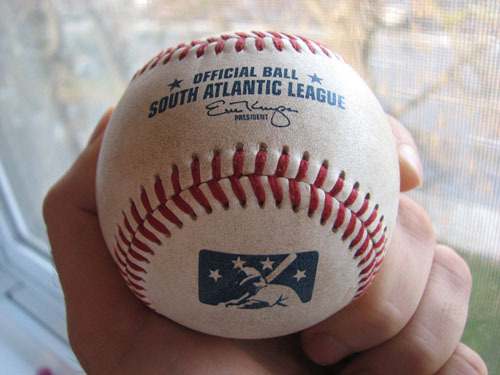 I just bought a beautiful case to hold and display the ball and I plan on getting it engraved. 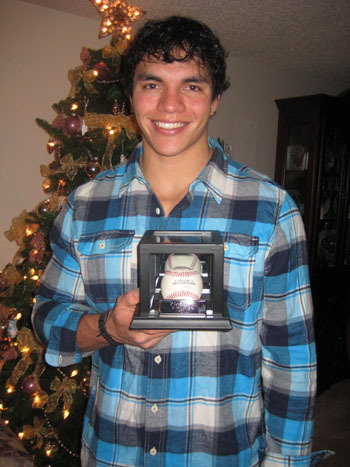 I would LOVE to give the ball back to him for a very special Christmas gift! If you could please contact me and let me know what you think, I would *really* appreciate it! Thank you so much for your time! 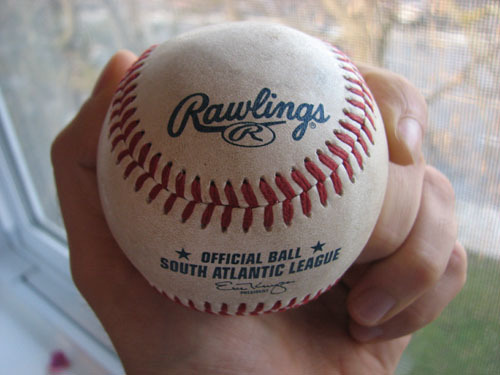 … and then put the ball in the mail the next day and kept my fingers crossed it would arrive before Christmas. The ball came in today!! I’m so happy it came in on time!! I put the pictures you sent me in a cute frame and then I put the article you wrote in a nice binder. Have a great holiday! I will talk to you soon. Thank you again for everything! I have to admit that over the holidays, I thought about how Jeremy might like the ball on Christmas Day, and looked forward to hearing all about it. Alicia also said she’d send some photos of Jeremy with the ball to use on my blog. Jeremy literally described this Christmas by saying, “This is the best Christmas I have ever had!” The whole thing went awesome!! I gave him a few other Christmas gifts I bought for him then I pretended that I was done with his gifts, so he gave me my gifts. When I was done opening mine, I acted like our gift exchange was over. He just kept looking at the ball and at me in a state of amazement! After that, I told him that I had another surprise for him. I put your article in this binder and added a cute little note in the beginning and end of it. He absolutely loved it!! The article in the binder worked out great because later in the evening when he went to show everything to his family and friends, he showed them the article first and then the ball … which made the story really great! After he looked through the binder, I told him that I had one last surprise for him! He was like “Alicia, are you serious? 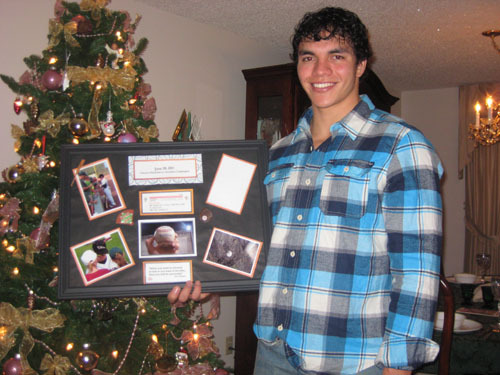 !” I made him this frame with the pictures that you sent me, the box score, and this cute motivational quote that he loves. Jeremy was so surprised and happy! He was like, “Does anyone in my family know you did this?” I was like,“No, I kept it a total secret!”He literally could not wait to get home and show everyone because his family and friends already knew the story about your article. It was seriously such an amazing Christmas! This Christmas was honestly my favorite Christmas too! 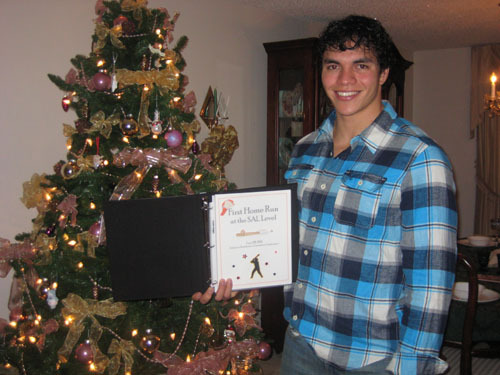 It was great to give Jeremy such a special gift and to see his reaction toward it. I cannot thank you enough Malcolm!! This Christmas was honestly perfect! THANK YOU SO MUCH AGAIN!! Strangely enough, I’m actually in the background of the photo above. See the guy with the yellow shirt and black cap who’s sitting alone in the top row of the section with the green seats? That’s me. I have to say, this whole experience was extremely rewarding for me. 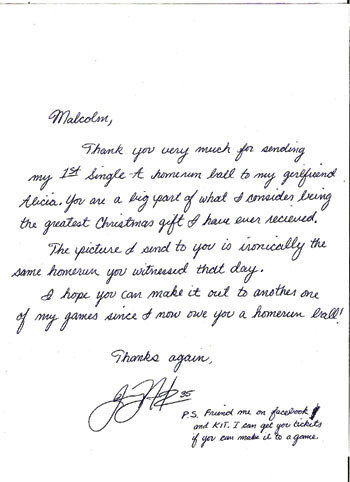 It’s obviously amazing to get the generous package from Alicia and Jeremy, but it feels amazing to see that Jeremy was so excited about getting the ball back. As much as Alicia and Alicia have thanked me, I thank them equally for allowing me to be a part of such a great experience. Obviously, I’m excited to follow Jeremy’s career and hopefully see him in action again soon! 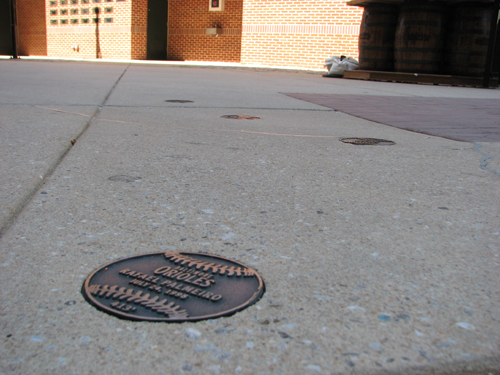 A full guide to Arthur W. Perdue Stadium is available on my website, as are guides to 15 other parks I’ve visited. Your visits and clicks help pay for my travels! For more travel adventures, please bookmark this blog and follow me on Twitter. 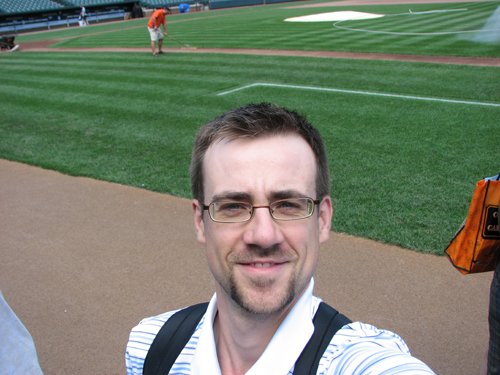 It’s still several months until I’ll be blogging about my 2012 baseball road trips for The Ballpark Guide. 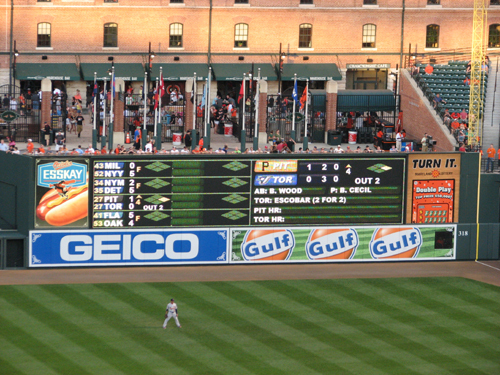 Fortunately, I still have a lot of interesting things to share from the 27 games I attended during the summer of 2011. One neat souvenir I’ve got from each of those games is my ticket stub. Now, ticket stubs are admittedly uninteresting to some people, but I think they’re great. And I think my wife approves, as they don’t take up that much space. I like how, for the most part, every ticket stub is different. I bought the top ticket in advance of my first game of the season at Rogers Centre, and it’s pretty plain. Midway through this game, a lady gave me the lower two tickets for the section behind the Jays dugout, as she was leaving early. The design on these tickets is much nicer; they’re likely from a set of season’s tickets. 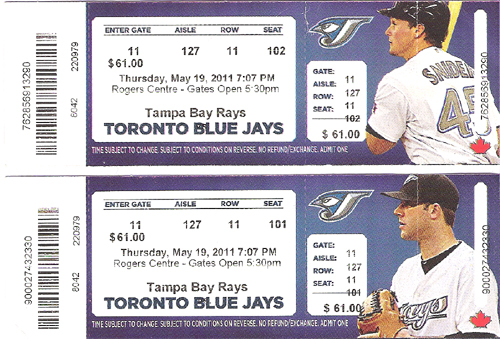 My second Jays game of 2011 had the same style of ticket as my first game. I think the Lansing Lugnuts offer one of the sharpest-looking tickets in the minors. I like the checker plate background, the large, stylized team name and how the ticket takers stroke out the side of the ticket with a Sharpie, rather than tear it. The simplicity of the Great Lakes Loons ticket is perfect. The Loons play in the small town of Midland, MI, and the design of this ticket is reflective of that rural setting. 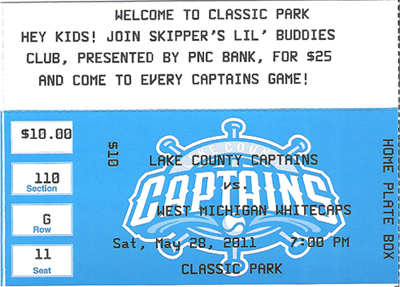 This West Michigan Whitecaps ticket is pretty standard: faded image in the background and the classic “ticket font” in the foreground. 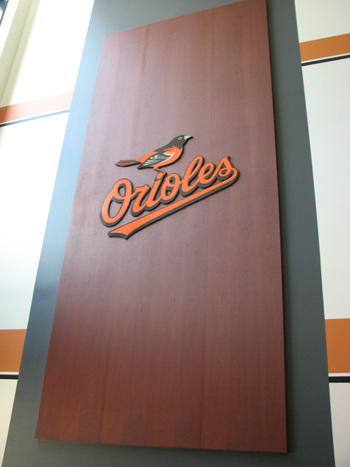 I do like, however, the vertical strip down the right side, featuring the ballpark and team logos. 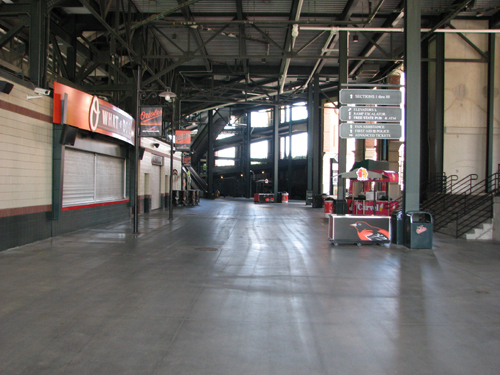 I bought this Tickets.com ticket in advance of my first visit to Comerica Park; obviously, there’s not much to see here. When I misplaced the above ticket while in Detroit, I was given a reprint at the ticket office. This one’s a little better, but the green (which, in its defence, is used to identify the ticket as being a reprint), looks weird when associated with the Tigers. The next day, I bought this ticket at the Comerica Park ticket office. As you can see, it’s virtually identical to the reprint from the day before, but has an orange/red border instead of the green one. The Toledo Mud Hens have a sharp-looking ticket and the pinstripe background is the first such design I’ve seen. From the stylized Mud Hens wording in the center of the ticket to the logo on the right, I’m a big fan of this one. While I loved my visit to Fort Wayne to watch the TinCaps, this ticket design lacks interest. The gray TinCaps logo in the bottom right corner blends into the background, which isn’t great. On the plus side, I like how the ticket identifies the name of your section and the Parkview Field wording stands out well. The Lake County Captains offer one of the most unique tickets I’ve seen. The right side is ripped off upon entry to the park, but even with this subtraction, the ticket is massive. The top part tears off, if desired, and the blue color and team logo give this ticket lots of visual impact. 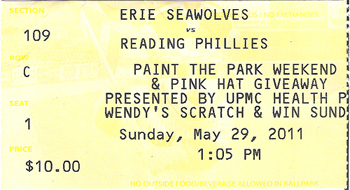 This Erie SeaWolves ticket is perhaps the most underwhelming I’ve encountered. It’s certainly got all the information you need, but its design is super sub-par. 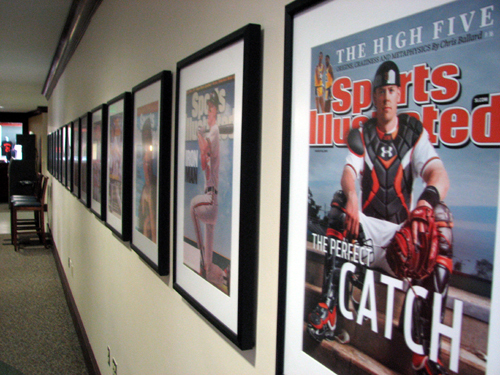 There’s some sort of baseball image in the background, but it’s virtually impossible to discern. This ticket is simply designed, and has large “Yankees” lettering in the background, although it didn’t show up in the scan. I’m still a little bitter about the price I had to pay for this game. 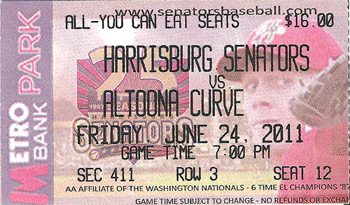 Stephen Strasburg is depicted on this Harrisburg ticket, which is cool. I also like the 25-year badge and the 6-time EL Champs lettering. 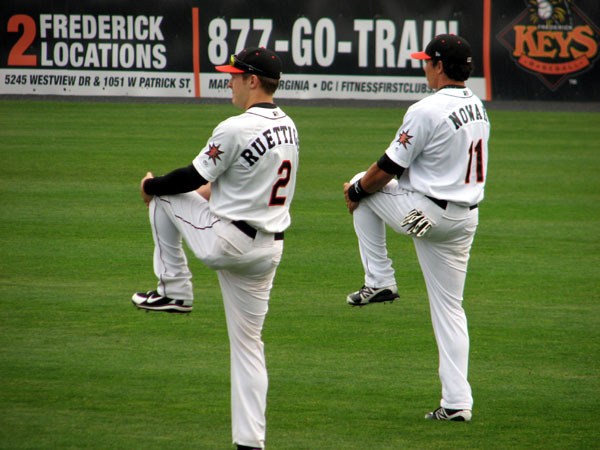 The IronBirds offer one of the plainest tickets I’ve seen thus far, but I like their sense of humor. See where it says “Fashionably Late”? That’s because I bought it on game day. The “SRO” lettering means standing room only. On the surface, this Baysox ticket looks fine, but the odd thing is that the team uses orange and black as its colors. (The team has a turquoise third jersey, however.) If this ticket had an orange tint to it, I’d call it a winner. Although the sunglasses on the Hagerstown Suns logo scream 1991, this is a catchy ticket. The fonts are a bit small, but I realize saying that makes me sound like a bitter old man who complains about neighbors who make noise at 7 p.m. The $8.80 price is a bit bizarre, too. Virtually every other ticket’s price is an even dollar value. Plain Jane is the best adjective for this Shorebirds ticket, which features no color and minimal graphical elements. I like the silvery shimmer of the logo in the center, but this ticket would be augmented with a splash of color. 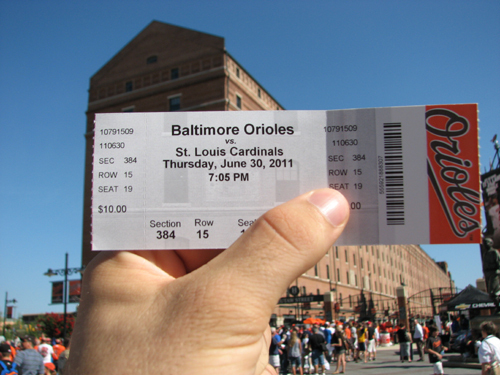 The Orioles offer a bland ticket, but like other MLB teams, the look of the ticket improves if you’re a season’s pass holder. The B&O warehouse is depicted in the background, which is neat. 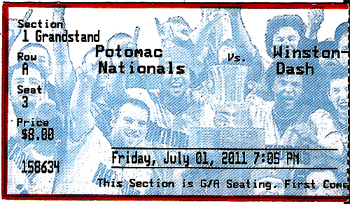 I’m not a fan of the way the Potomac Nationals rip your ticket upon entry, but this ticket is neat because it features a background image of the P-Nats’ 2010 Carolina League championship team. Like the Blue Jays and Orioles tickets I showed above, the Washington Nationals use a standard ticket template for fans who buy at the ticket office. Ditto. But I like the price on this one better. The background color of this Binghamton Mets ticket certainly catches your eye. The Mets logo on the upper right of the ticket is nice, but I find the other team logo gets lost behind the visitor’s name. Still, a nice ticket. The New Hampshire Fisher Cats have a tear-off Modell’s coupon on the left side of their tickets, but the rest of the design is sharp. I like the Fisher Cats logo in the background and the 2011 Eastern League All-Star Game emblem in the bottom left corner. The Portland Sea Dogs take an interesting approach on their tickets, showing an image of the team’s alumni jersey wall in the background. 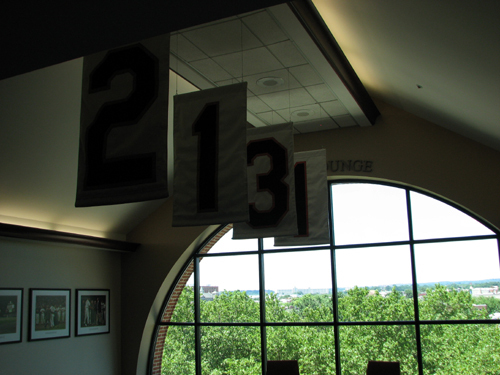 With a sharp eye, you can catch the jerseys of David Ortiz, Clay Buchholz, Jacoby Ellsbury and Jonathan Papelbon, among others. I find that the Green Mountain Coffee coupon on the left of the Lake Monsters ticket takes up a bit too much space, but I like the background image of the team celebrating. Not to sound like a broken record, but the Indians’ standard ticket is pretty similar to the other MLB teams in my list. 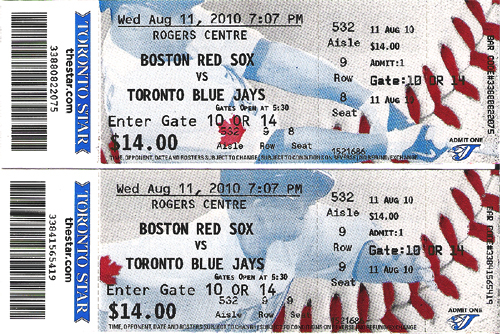 As a bonus, I thought I’d share the tickets from the games I attended in 2010. This ticket’s special to me because it’s the ticket I bought for the first ballpark I visited for my website, TheBallparkGuide.com. I bought it in advance, so it’s got my name printed across the middle, which is sort of neat. 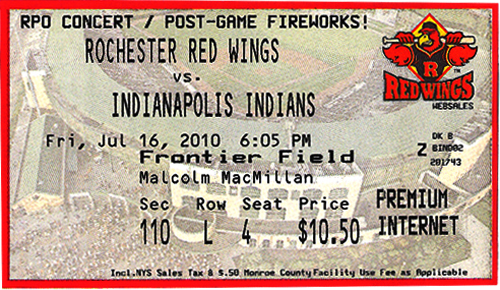 The ticket itself features an overhead view of Rochester’s Frontier Field. I absolutely love this ticket. It helps that my visit to Auburn was amazing, but I love the simple design of this ticket. The Doubledays are publicly owned, and have a tangible community-oriented feel. This one-of-a-kind ticket just supports that. The Syracuse Chiefs used this ticket in 2010 to commemorate their 50th season as a modern-era franchise. 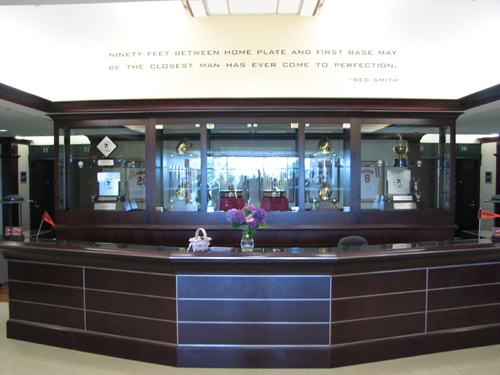 Although it’s hard to see on the scan, the design includes baseball card images of past Chiefs. This 2010 Buffalo Bisons ticket is pretty generic. There’s a standard crowd image in the background, and if it weren’t for the red/orange seats, I wouldn’t know it was taken at Coca-Cola Field. Of note is the angry-looking guy to the left of the world “Buffalo.” I think the team could’ve done better. Virtually the same ticket the Indians used this summer. The New York-Penn League’s Scrappers have a simple, effective design on this ticket from 2010. The background image features the team celebrating in the infield after a win. And I have to chuckle at the “No Outside Food/Beverage” reminder in the bottom right. This ticket featuring Adam Lind is nicer than the plain tix the Jays sold in 2011. These two tickets show Vernon Wells and Aaron Hill. I also like how the tickets indicate the time that the stadium opens. The baseball stitches along the right side are sharp, too. The ’10 Fisher Cats ticket is very similar to the ’11 version. The chief difference is the change in the team color and ballpark name. 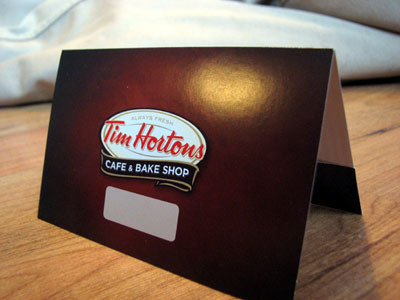 I don’t like how the side of this ticket got ripped off, but the design is nice. Because I’m such a fan of ballparks, it’s neat to see Joseph L. Bruno Stadium depicted in the background. This ticket works well. 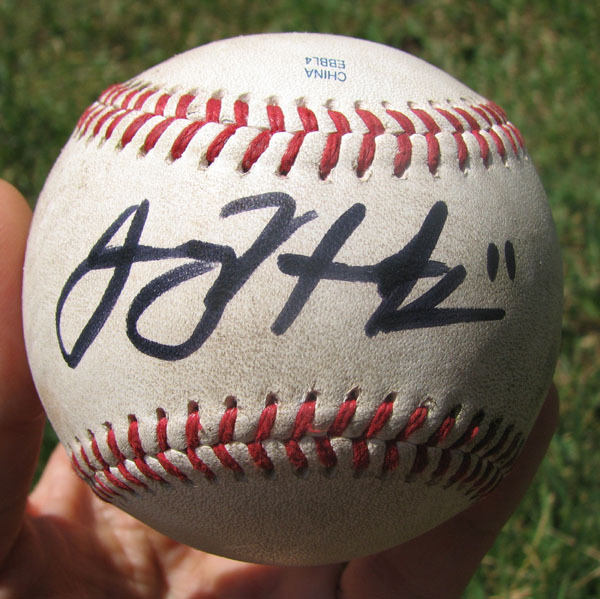 Today, and for the next three days, I’m going to post a photo of a different autographed ball I got on my last road trip for The Ballpark Guide. Make sure to follow me on Twitter or bookmark this blog to see my next post. 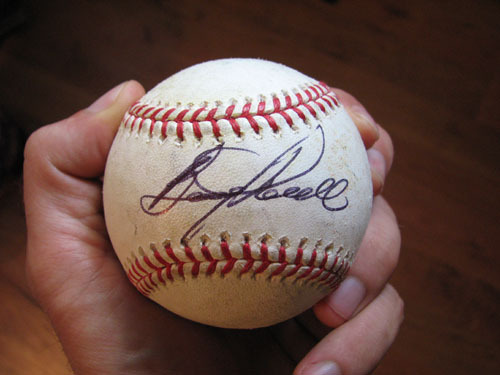 Powell is a two-time World Series winner, four-time All-Star and hit 339 home runs in a career that spanned from 1961 to 1977. 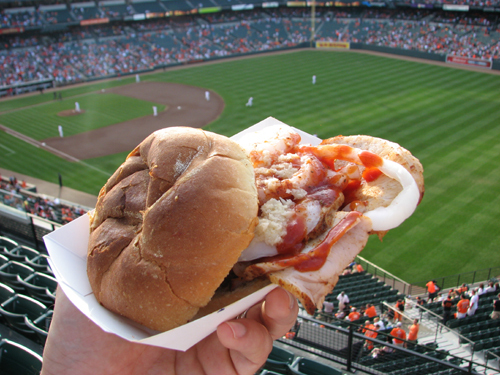 Powell currently owns Boog’s BBQ at Camden Yards, and frequently hangs out at the popular eatery and meets fans. I got to meet him and get a photo with him during my second game in Baltimore on June 30. Which autographed ball will I feature tomorrow? Check back and find out! Finally, I’ll have news on my next road trip very soon. 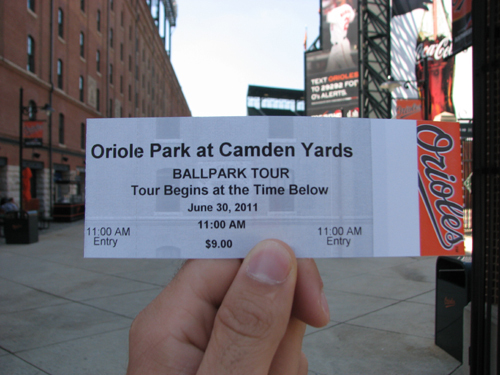 Because I’ve already blogged about Camden Yards, I’m not going to go overboard with this post. That said, my second Baltimore Orioles game in as many days was great. I really like this ballpark. It’s a ballpark, not a stadium, so it’s got a great feel to it. While it’s huge, it still has a “ballpark-y” feel, which is the type of place I enjoy. 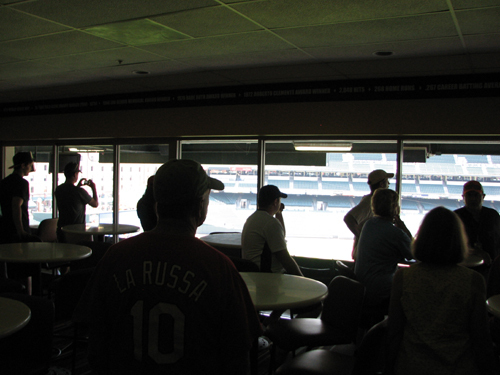 After eating, I moved over to the upper deck down the third base line, where I could keep an eye on the out-of-town scoreboard to see how the Jays were doing. Losing to the Pirates? What’s the world coming to? The following morning, I’d head for the D.C. area, but not without a bit of sadness. 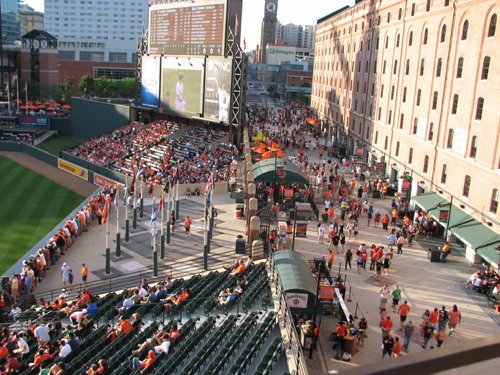 My two days in Baltimore were even better and I’d expected — a great ballpark, amazing sights and lots to see and do. I’ll definitely be back. 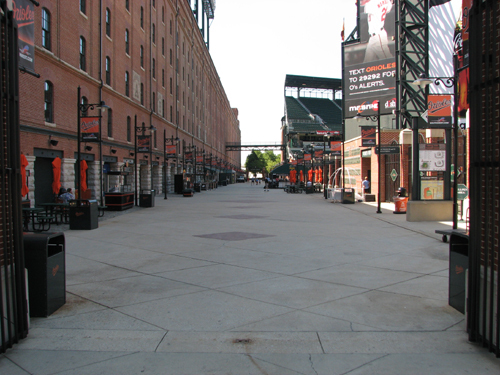 If you read my previous post, you might remember that when I went to bed at 3 a.m. after my first Orioles game, the park was still full of people cleaning it. I woke up at 7:15 a.m. on June 30, looked out the window and saw the grounds crew hard at work. Talk about dedication! Now, it was the cleaning staff, not the grounds crew, that was working past 3 a.m., but the grounds crew was working on the field after the previous night’s game. Now, about eight hours later, they were back at work. Soon, our tour began. Our guide, Floyd, was great. He was thoroughly knowledgeable, funny and interesting. 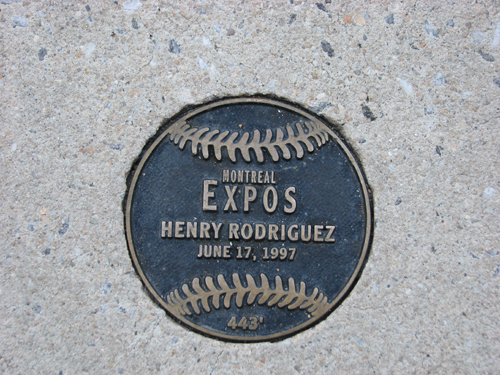 He told us a lot about the planning and construction of the ballpark and even gave us facts about the surrounding area. 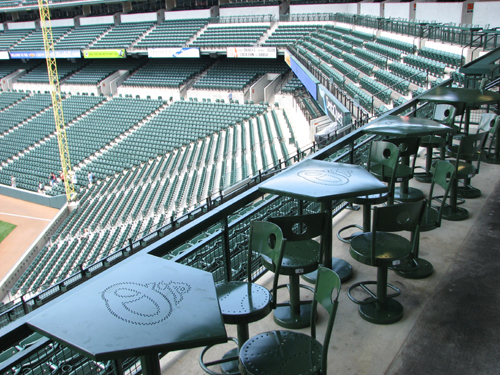 Guess how many people work at the ballpark on game days? If you said 900 to 1,000, you’d be right. 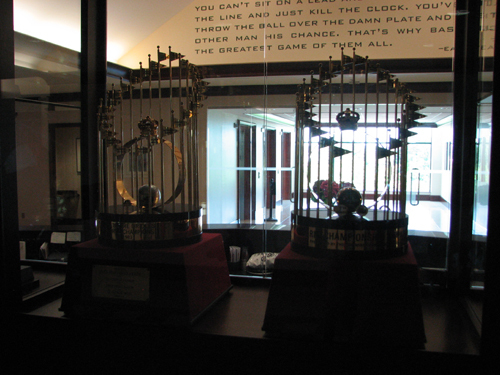 By the way, these suites run $90,000 to $400,000 a year. 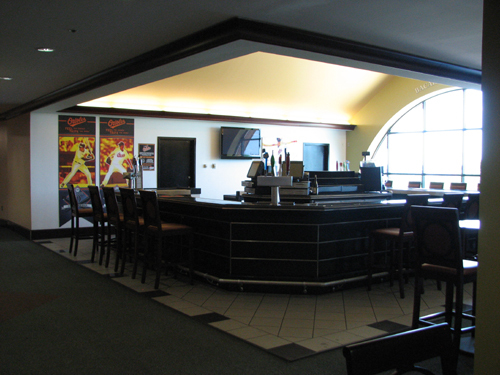 It makes me cringe to think about that the suites at Yankee Stadium cost. We left the field via the umpires tunnel, which is directly behind home plate. 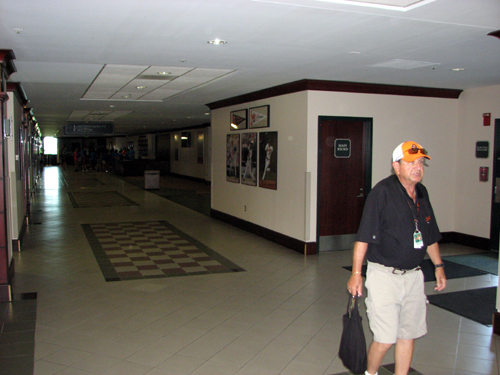 We walked up the tunnel to another tunnel, which runs around under the stands. 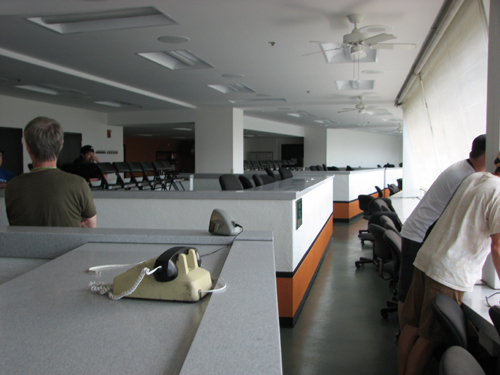 From here, you can access both clubhouses and, of course, the umpires room. 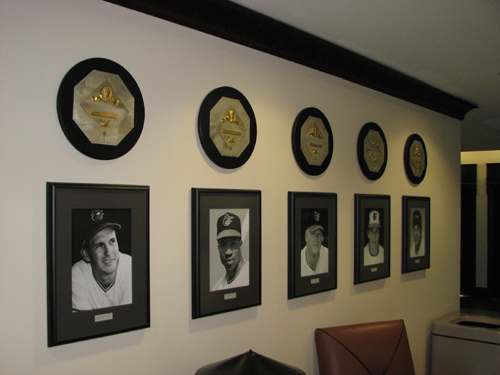 Floyd showed us the peep hole in the umpires room door; apparently, it’s the only peep hole in the entire ballpark! What an amazing tour! 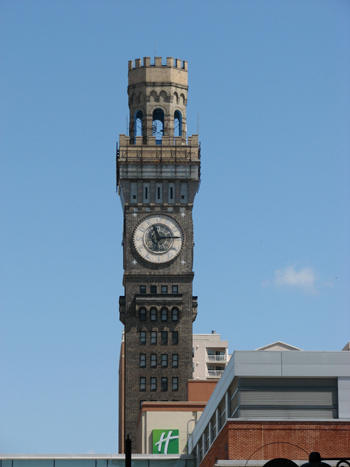 I’ve said a lot here, but that doesn’t mean you shouldn’t take the tour if you’re visiting Baltimore. The guide provides so much neat information that you’ll learn a ton, regardless of how much baseball knowledge you have. 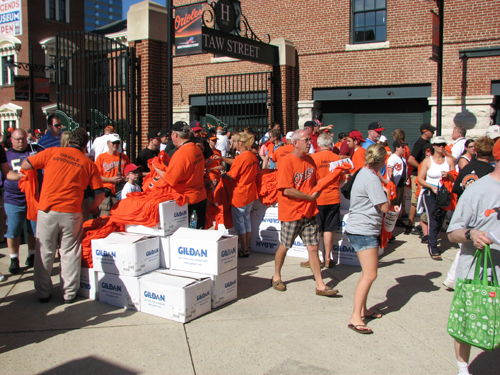 I spent the rest of the day on a giant walk around the harbor (blisters on my feet will attest to that) before heading back to Camden Yards around 5 p.m. for my second O’s game.